Salmon contains one of the most sought out nutrient – Omega 3! It is one of the favourites with fish lovers... It is juicy and perfect for recipes which require grilling. It originally is a fresh water fish, which migrates to oceans and returns to its original location. It is native to North Atlantic and Pacific oceans; but is also produced in aquaculture in many parts of the world. It is commonly known as Raavas in India. Nutritional profile of Salmon is quite strong with the presence of omega 3 fatty acids (which is needless to say a good type of fat). It also is a very good source of protein and a good source of energy too. It also contains a very good amount of vitamin D, vitamin B3, B6, B12, and selenium. A lot of nutrients to get attracted too! High in one of the very beneficial nutrient – omega 3! Helps lower the bad cholesterol (LDL) and maintain a healthy level of it. Helps to reduce the blood triglyceride levels, thereby improving heart health and controlling diabetes. Some studies suggest that high intake of omega 3 lowers depression in the people who are emotionally vulnerable. It also helps to reduce aggression and stress by reducing the amount of cortisol (which is also known as stress hormone). Studies from a journal “HIV Clinical Trials” showed that as a side effect of the treatment given to HIV infected patients increased their triglyceride (TG) levels. Omega 3 supplements played a major role in reducing the TGs in these patients. Myth : There cannot be any side effects of such a nutritious fish as Salmon. Fact: Salmon contains a substance called purines, which is broken down to uric acid in our body. People with conditions like Gout and/or uric acid kidney stones are advised to restrict the intake of high protein foods like Salmon. Myth : Since Salmon is a fatty fish, it is not good for health. 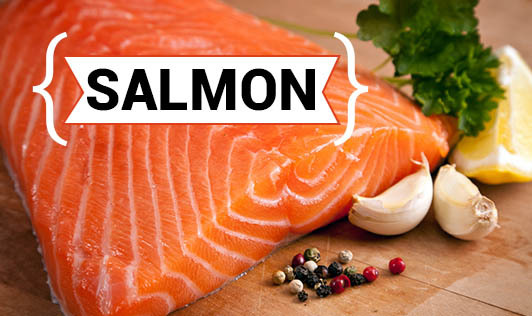 Fact: Salmon is a fatty fish, but contains good fats. It is full of omega 3 fatty acids which has numerous health benefits. People who are on a weight loss program should eat it in moderation after consulting a Dietitian. Roasted Salmon dishes taste too yummy inspite of being healthy! Once in a while, you can try fish fry with Salmon. It can be used for preparing cutlets with some binding agent. It can be stir fried and added to raw vegetables to make it into a tangy salad. Salmon sandwich with lettuce would be a perfect snack! Grilled Salmon can be a good option as a side dish with alcohol intake. Salmon can be tossed in little butter and added to the pasta which you prepare at home. Grilled or roasted Salmon can be a good option as finger food for school children... it gives a lot of energy and proteins!